The G.A.S.TTP heat allocation meter is a version of the standard G.A.S.TT meter designed for use in baseboard hydronic heating systems that employ non-electric (pneumatic or Danfoss style) zone valves. The G.A.S.TTP meter uses the proven G.A.S.TT hardware design but employs two thermistor temperature sensors and proprietary firmware algorithm to accurately meter variable water flow water flow rate systems from 0.1gpm to 5gpm. Non-electric zone valve systems modulate water flow to the apartment over this range to depending upon thermostat setting and heating demand. The G.A.S.TTP meter uses two pipe-mounted sensors to accurately measure BTUH for the entire apartment heating loop - one installed at the mid-point of the loop - the second at ¼ loop length from the loop inlet. 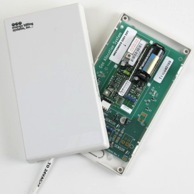 The G.A.S.TTP includes tamper detection circuitry which detects resident tampering, battery failure or meter failure to facilitate meter servicing. Time -Temperature data output is directly compatible with the standard G.A.S.TT allocation meter.